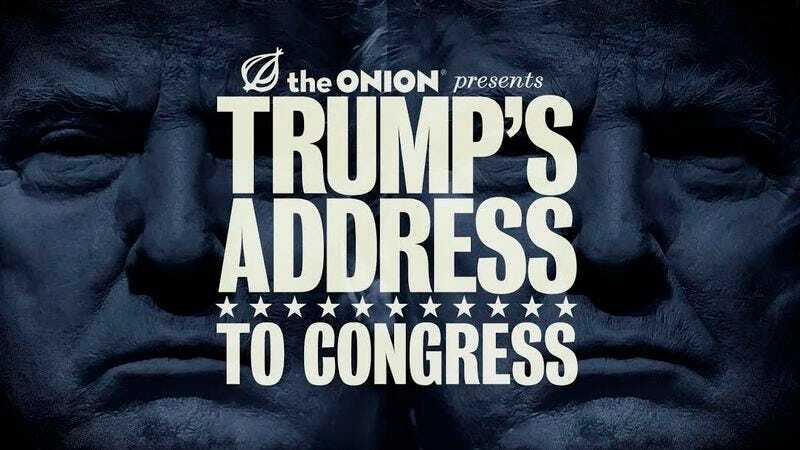 We have no idea what sort of mess Donald Trump is going to spill all over America’s lap like scalding hot McDonald’s coffee in his address to Congress tomorrow night, but whatever it is, our sister publication The Onion will be there to help us through it. Yes, whether it’s a war with Luxembourg or replacing textbooks in public schools with discounted Ivanka Trump blouses, The Onion will be providing “real-time, running commentary throughout the President’s speech and the Democratic response through a series of on-screen graphics” on its The Onion Presents Trump’s Address to Congress special on Fusion. Onion superfans may recall that we previously ran a special on Fusion called The Onion Presents: The Iconic Images of Election 2016, but that was back when we still thought hope was possible, and besides it wasn’t live. This one, meanwhile, is live, and will begin on Fusion tonight at 9:00 p.m. ET, as well as on a livestream on our sister site.